when i went to visit my aunt carol -- the one i had met on the phone just a month before -- she had a special box on the table. this box was filled with little boxes. in each little box was a memento of my birthmother's that carol wanted me to have. i could barely bring myself to open the box. each time i reached over to it, tears came. so i waited while we talked. finally it was time. almost time for me to leave, and time to look in the box. i sniffled and opened each little box, astounded at carol's generosity. 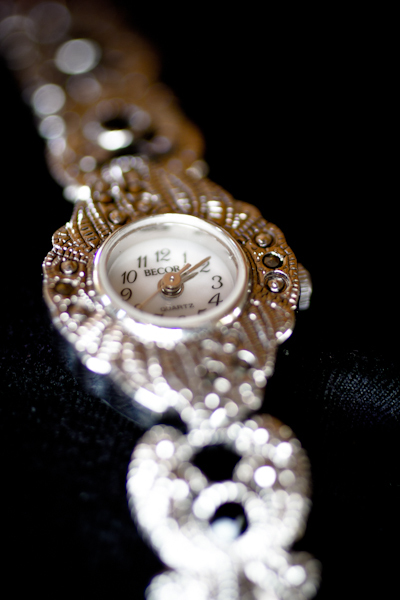 carol gave this watch to my mother nancy. and when nancy passed, carol got it back. and then carol gave it to me. i finally replaced the battery yesterday. i love it! it is light and delicate and reminds me of both carol and nancy. i will treasure it forever. oddly, i am currently going through my mom's jewelry, seven and a half years after she passed. it is time. time to clean my closets. and time to move it all on to new owners and admirers. new mothers and aunts and daughters and nieces. so i'm keeping a few special pieces, and boxing up the rest and shipping it off. and oddly again, i'm sending it to a friend with a jewelry store whose mom (adopted mom, like my mom) is in hospice with not much longer to live. strange how Life presents these little riddles and coincidences. when i see Life bringing sets of circumstances strung together such as this, i know there is something important here for me to see. maybe it is how somehow, we womenfolk -- mothers and aunts and nieces and daughters and sisters -- are really all connected. ALL womenfolk everywhere, for all time ... connected. in such a precious way. gifting each other our precious jewels. and hearts.